As a first impression of this distillery I can’t say anything other than that I’m impressed. It’s like a liquid creamy desert with good depth of flavour and a remarkable balance. The glue, solvent tones on the nose fade quick enough to make room to the fruity and creamy aromas. 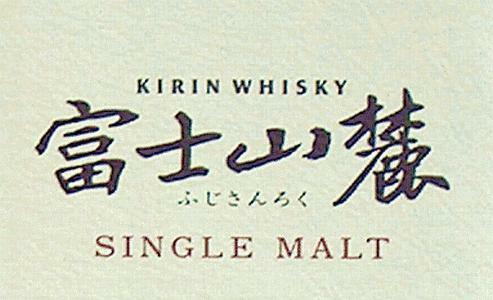 It’s a vibrant and playful whisky that is quite engaging. From a price point of view this is ridiculous! 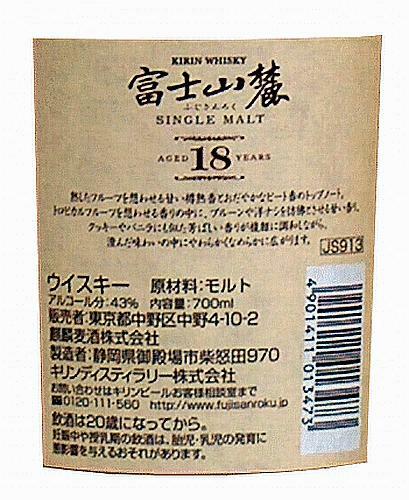 It costs (in NL 01/2017) more than €400,- and I know age stated whisky’s from Japan are rare but this is overdoing it (and not just a little). All in all a surprisingly good and well balanced whisky. A fresh, sweet and well balanced whisky with aromas of glue, acetone, plasticizers, pineapple, green apple, berries (red currents, raspberries), icing sugar, ginger, vanilla, toffee, caramel, prunes jam, hint of old fashioned anise milk, mocha, milk chocolate, roasted coconuts, almonds, custard, old books, floral tones, cedarwood and subtle oak. 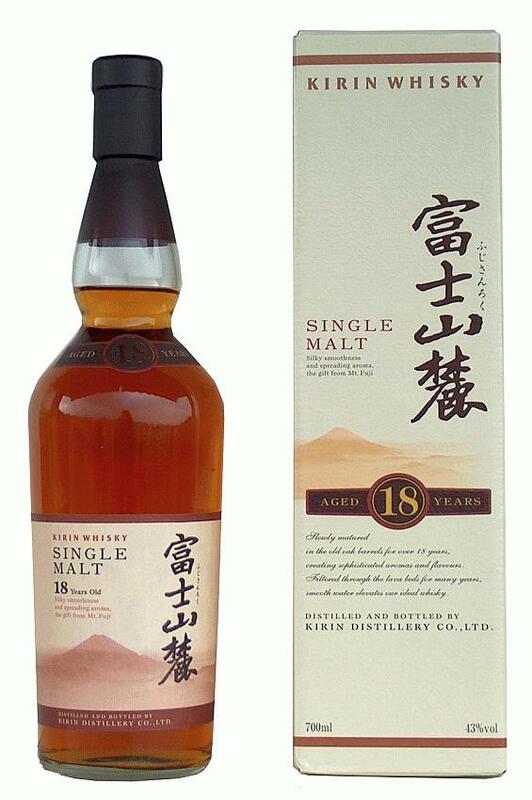 A fresh, fruity and well balanced whisky with aromas of candied ginger, milk chocolate, coconut, vanilla, prune juice, floral tones, berries (blueberries, red currants, raspberries, strawberries), boiled sweets, toffee, caramel, white pepper, tannins, pine resin, cinnamon, subtle earthy tones, canned apricots, cedarwood and charred oak. A medium to long, sweet and slightly drying finish with aromas of honey, ginger, milk chocolate, coconut, tannins, cinnamon, almonds and creamy oak. N- Interesting, almond beancurd custard, soft lemon, whiff of new paint, caramel. Rounded, a dram that I will take as dessert. P- Sweet as expected, almond and cream soda, wood extract with fair amount of dry oak kicks in. 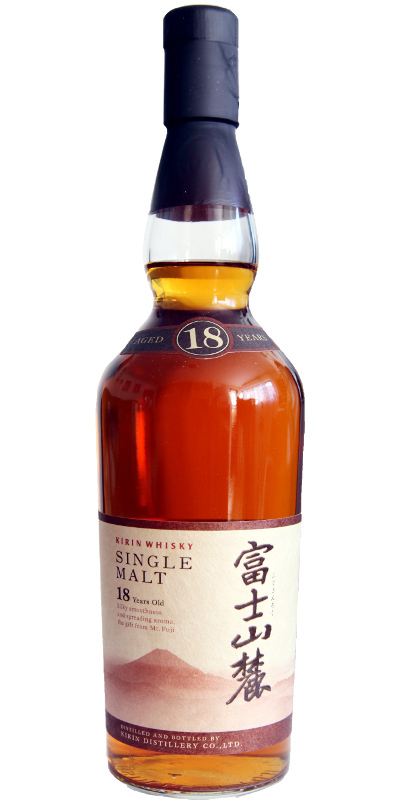 F- Long and smooth, buttery mouth-feel, nutty sweet notes with playful spiciness, a charming 18YO. 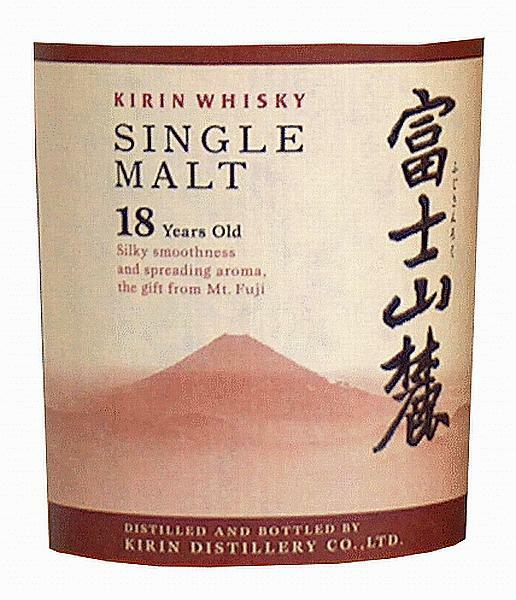 Whiskies from Fuji Gotemba distillery are hard to find and this one is very expensive in Europe. My first sample from this distillery and I must say that it is a very good whisky indeed. Starts aromatic and mellow on notes of varnish and artificial fruit flavors. A combination of canned apricots, pencil shavings, old books and light blossom honey. Lovely. Smooth and dry with quite strong influences from the oak. Dark apricot cake, pencil and sandal wood, toffee and yeasty notes. Nice and totally pleasant. Medium long with the aromas from the palate lingering on, becoming slightly dryer.